LPI Capital Bhd is a diversified insurance company that provides a wide range of products. LPI Capital generates revenue by writing premiums on insurance policies that it sells to individuals and businesses. The company’s personal insurance offerings include fire, health, liability, auto, and accident insurance. LPI Capital’s business insurance product portfolio expands on its personal line products by adding marine, glass, and burglary insurance. The company offers flexibility to its corporate customers by providing tailor-made plans for small and midsize enterprises. Nicole Chow What does it mean by margin of safety? Tigerbeer What happened suddenly drop 20 cents? Nicole Chow cheers....it rose back d.....LPI is always like that....like an elephant ! VivoPrince Slowly rebounding in anticipation of CNY 2019's dividend. ZHYsuper what news are you waiting for? neverlose when financial report coming out? Nicole Chow Luckily didnt come out today. Friday normally dont have good news. VivoPrince Not wanting to sound pessimistic but am only expecting a so-so piece of financial results considering the current challenging operating conditions ... hopefully, the dividend rate can be maintained like last year's. Nicole Chow 2016 got one off gain. Exclude that one off gain, 2016 result drop. 2017 result return to normal 2018 3Q accumulated flat. Result good or x depend on Q4. shpg22 Good result. FY18 dividend payout totaled at 68.0 cents, up 13% compared to FY17. That translated to 4.1% DY at current price of 16.38. Buy at target price of 17.00. You only need to own 1 company share that is LPI. 99% of other company on BURSA will make you poorer for sure. 3iii Business is fine and growing organically. million, arising partly from its higher retention ratio of 68.4% as compared to 61.0% reported previously. However, the claims incurred ratio for the year under review had increased to 40.9% from 38.5% mainly due to deteriorating claims trends observed in both motor and medical portfolios. reviewed to ensure favourable performance. With commission for the year at a higher 6.3% and management expenses ratio maintained at 20.1%, Lonpac’s combined ratio increased to 67.3% from 64.0%, resulting in a slightly lower underwriting profit of RM303.5 million, a 0.8% reduction from RM305.8 million achieved in 2017. 3iii Fire insurance remains the core portfolio of business contributing 42.4% of its total written premium. During the year, both motor and medical insurance portfolio had also reported strong growth whereas engineering insurance suffered a decline in written premium, affected by the slowdown in the number of project risks and termination of government infrastructure projects. 3iii “For the 12 months period ended 31 December 2018, LPI registered an increase in its revenue by 2.9% to RM1,513.7 million from RM1,470.6 million recorded in previous corresponding period. Its profit before tax increased marginally from RM403.7 million previously to RM406.0 million while net profit attributable to shareholders stood at RM314.0 million, a 0.1% increase from previous year of RM313.8 million. Earnings per share of LPI for the year recorded 78.83 sen and net return on equity registered lower at 14.6% from 16.3% previously. newbie8080 Quite pricey at current PE=20. 3iii Trading at fair price. shpg22 LPI as Malaysia's Berkshire Hathaway should deserve a premium price. 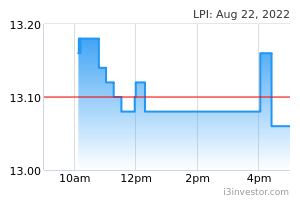 There aren't much quality company like LPI in Bursa. As I said before, you only need to own LPI in Bursa, the rest (99%) of other companies are listed to make investor poorer. shpg22 Despite this facts, 99% of retail investor would rather buy stock other than LPI. Berkshire Hathaway is an investment company different from LPI which is just an insurance company. Bershire also do not declare dividends unlike LPI. Totally different type of company. Aeon credit is non bank financial institution offering small loans and credit card to consumers. LPI is a insurance company. shpg22 BRK use GEICO (insurance company)'s float to invest in other companies. Similarly LPI, mostly on PBBANK. Anyway I m referring to its stock performance vs BRK. Nicole Chow any other counter as generous as LPI? andersonleee LPI is like pushing back to 17 soon. Nicole Chow Ex date 14.2.18....so expected will rise till tmr. Btw, when we will know the date and venue of LPI AGM this year? Refer to Bursa Malaysia website for announcement. The company normally announcement it 1 month before the AGM date and usually notice issued by end of February. Fabien Extraordinaire LPI is at fair valuation. 3x BV. tsc516 Nicole chow, if not how you buy? My personal view it's at FV. Unless they can grow their earnings at least matching the economy then PE expansion is possible, towards 25x. Fabien Extraordinaire assuming LPI can produce consistent 15% ROE every year. in other words compounds its book value 15% every year. how much book value multiple should u pay for? is current multiple of 3x a fair value, overvalued or undervalued? enigmatic 1 year low.Discount for a limited time only!